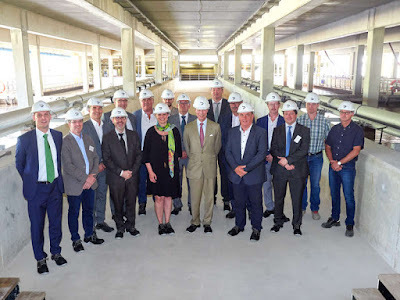 On the 4th, Grand Duke Henri was in Diekirch to visit the Administration de la gestion de l’eau (AGE) -- i.e., the Water Management Administration -- and learn more about flood forecasting. The role of rivers and dams was foremost during the engagement. After this, the Grand Duke took the time to see the expansion to the wastewater treatment facility in Bleesbrück, at the Syndicat Intercommunal de Dépollution des Eaux Résiduaires du Nord (SIDEN). The Minister of the Environment Carole Dieschbourg was also in attendance. Information and another photo from the Cour website.